The Central Valley Project is a federal water management project supervised by the United States Bureau of Reclamation. Conceived in the 1930's, the Central Valley Project (CVP) dwarfed all other water infrastructure in California at the time. The CVP draws from three major watersheds with the primary purpose of irrigating converted cropland in California's Central Valley. Water delivered via the CVP reaches over 400 miles, from the Cascade Mountains near Redding in the north to the Tehachapi Mountains near Bakersfield in the south. CVP infrastructure consists of 20 dams and reservoirs, 11 power plants, and 500 miles of major canals, as well as conduits, tunnels, and related facilities. The CVP manages approximately 9 million acre-feet of water. Annual deliveries top 7 million acre-feet of water for agricultural, urban, and • wildlife use. 5 million acre-feet of water goes to farms – enough to irrigate about 3 million acres, or approximately one-third of the agricultural land in California. 600,000 acre-feet of water feeds municipal and industrial use – enough to supply close to 1 million households with their water needs each year. 800,000 acre-feet per year is dedicated to fish and wildlife and their habitat including 410,00 acre-feet going to State and Federal wildlife refuges and wetlands, pursuant to the Central Valley Project Improvement Act (CVPIA). 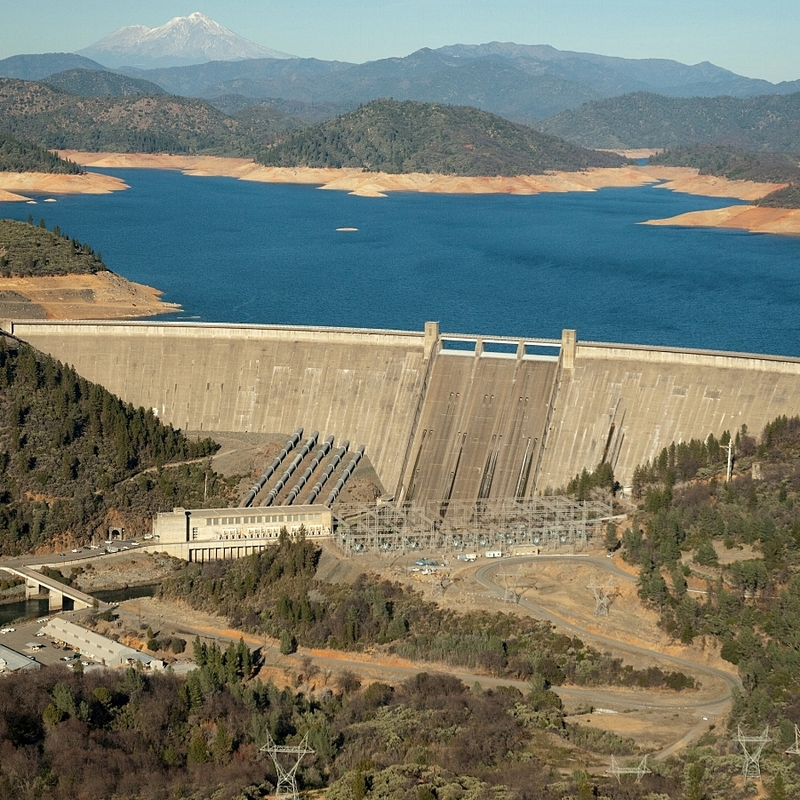 In addition, Central Valley Project dams produce over 2,000 megawatts of hydroelectric power, and provides flood and salinity control for river valleys and watersheds. Moving that much water is bound to do as much harm as good. Many CVP facilities wrought significant environmental damage, starting with the decimation of salmon and steelhead runs in the Sacramento and San Joaquin rivers. Decades of declining fish populations, severe pollution, groundwater contamination and flooding of historic archeological sites led to the Central Valley Project Improvement Act (CVPIA) of 1992. Despite passage of the CVPIA, disputes continue and the CVP remains a focal point of polarization.